The Mauritius Guide will provide first hand information about Mauritius. Here you can get to know Mauritius and dream about climbing almost untouched mountains, exploring waterfalls, diving into the reefs, swimming with dolphins and, of course, relaxing at the wonderful beaches, where you can listen to the sound of the sea, the famous tune of the colorful ice-cream-cars and the drums of séga music. Maybe you are even in the lucky position of not only dreaming about being in Mauritius, but to actually plan your trip to the little island that is so often compared to paradise. When visiting some of the various restaurants or passing by one of the little street stands which sell sweets and other snacks, you can even taste Mauritius’ variety of cultures. You will for example experience the people’s laid back attitude, their hospitality and their ability to speak three languages. Nevertheless you are spoilt for choice. There are so many things to see! Hopefully the Mauritius Guide can be a source of inspiration where to go and what to do. Please do not hesitate to contact us if you have any comments or suggestions. Have fun exploring the Guide! Do you want to have an unforgetable experience during your holiday in Mauritius? In this case we recommend you to try skydiving with Skydive Austral. Get yourself into this unique adventure and you will never regret it! Step out of the aircraft door with your professional tandempartner at 10000ft and fly towards the ground at 200km/h for some 45 seconds! Do not miss the opportunity to enjoy Mauritius´ wonderful landscape from above! Book now on our website and you get 10% discount! Read more! A nice massage after skydiving does this not sound nice? 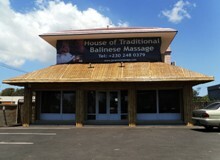 In the north you can find the “house of traditional balinese massages” which offers very professional massages. So if you appreciate good massages this is the perfect spot. So do not wait and get pampered there. Read more! Enjoy a memorable day with the team of Vertical World. 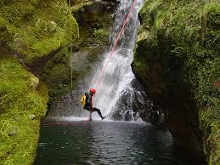 Climbing or abseiling down waterfalls at magic places not many people usullay see in Mauritius. Enjoy lush vegetations and a beautiful day in nature. Read more about canyoning.. If you are thinking about travelling to Mauritius, visit our site about self catering apartments in Mauritus.